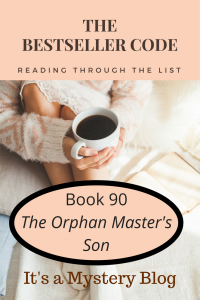 The Orphan Master’s Son, by Adam Johnson, is our next novel from The Bestseller Code 100 list. The Orphan Master’s Son was an extremely difficult book to read in many ways. The book is divided into two distinct parts. In Part One we meet Pak Jun Do, the Orphan Master’s son, who named himself after a Korean Martyr heralded for his loyalty, and thus foreshadows the ending of the novel. From Pak Jun Do’s early childhood well into adulthood, his journey felt disjointed, with jumps in time and location. We learn what life is like in present-day North Korea – the hardships, the loss of personal will, the disinformation, and the need for blind adherence to the rule of “Our Dear Leader.” In Part Two, Pak Jun Do assumes the life of legendary Commander Ga, who is married to the renowned actress Sun Moon and father of their two children. Also in Part Two we are introduced to a “soft-torture” Interrogator of Division 42, the interrogation headquarters where enemies of the state are tortured for confessions. Throughout this part, the story alternates between the Interrogator’s personal and professional life – including his interrogation of “Commander Ga” – and the flashbacks of Pak Jun Do’s life as Commander Ga. According to the back matter, the author has described it as a “trauma narrative.” … In other words, it feels as if it was written by a person who has experienced severe trauma. He says that it would be a mistake to shape it any other way and I have to agree it makes sense. Trauma narrative is a very accurate description. I felt traumatized just reading it. The second part was an easier read, although it did take a while to adjust to the jumps in time from the present day interrogation to the previous year of “Commander Ga’s” life. I read with amazement and disbelief as everyone walked around the elephant in the room – Pak Jun Do was obviously NOT Commander Ga, and yet he was able to assume the life of Ga because he dressed as Ga and said he was Ga. In North Korea, you just do not question what anyone in a position of leadership above you says or does. To do so would mean immediate banishment to the camps and certain death. Ultimately, this story shows us how the regime of North Korea purposely destroys the concepts of individual choice and personal freedom throughout its population. The fact that both the Interrogator and Pak Jun Do practice personal choice and experience freedom at the end gives hope that all citizens of North Korea might eventually be able to attain true freedoms, if given the chance. The Orphan Master’s Son is one of those books that stays with you for a long time and not necessarily in a good way. There is so much symbolism and so many layers that it really warrants a second reading. It would be a great choice for a book club to read and discuss, as long as the members were aware of the violence and disturbing nature of the story line ahead of time. I was not really prepared for that and set the book aside for long enough that the library ended my ebook loan, which has never happened to me before! The Orphan Master’s Son by Adam Johnson won the 2013 Pulitzer Prize for Fiction. It is an incredibly deep, complex novel. Let’s take a brief look at it from a writer’s perspective. Summary: The history and culture of North Korea are mysterious. Adam Johnson pulls back the curtain, and delves deeply into the lives of leaders and regular citizens alike. It follows Pak Jun Do who eventually assumes the identity of Commander Ga, the husband of a famous actress named Sun Moon. Some of this analysis follows the “Questions and Topics for Discussion” in the back matter of the book. Because it won the Pulitzer Prize for fiction, one would assume The Orphan Master’s Son is a work of literary fiction. Although it follows some of the tenets of literary fiction, such as emphasis on themes and exploration of the inner life of the main character, it borrows from many genres. It has been called a thriller, a romance, and a work of political dystopia, although each of these categorize only parts of the novel. In other words, it feels as if it was written by a person who has experienced severe trauma. He says that it would be a mistake to shape it any other way and I have to agree it makes sense. 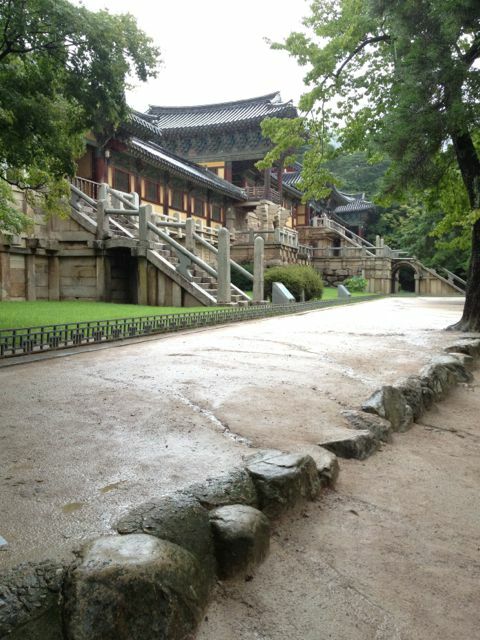 The protagonist throughout the novel is Pak Jun Do. He starts out life as the son of a man who runs an orphanage. Because of this, he is often mistaken for an orphan in later life, a label that means most of the time he is treated poorly. After spending a few years working in the total darkness of the tunnels that pass under the DMZ into South Korea, he moves on to become a kidnapper who grabs Japanese citizens and brings them back to North Korea. Climbing up the food chain, he joins a fishing boat to spy on boats and submarines from other countries. Finally he assumes the persona of Commander Ga, a confederate of the “Dear Leader.” Other, more fantastical, events occur along the way, including a trip to Texas. In most books we expect one protagonist. In this case, however, the novel is so epic and the tones and topics change so much throughout the course, perhaps one was not enough. It might have been easier for the reader if the author had followed multiple characters and tied them together at the end. Frankly, it strains the imagination that one person had all these things happen to him. The novel is unique because it is set in North Korea, a place that remains largely cut off from the rest of the world. Adam Johnson has gone to great lengths to make sure the setting is a real as possible. He interviewed people who defected from North Korea, he read newspapers from North Korea, and even traveled there to see it first hand. This level of research takes the book to the prize-winning level. The realistic underpinning makes reading it an educational experience. At one point I wondered why the North Koreans went to Japan to kidnap people when their own citizens were starving. It became clear as the novel progressed that they cherry-picked victims to perform tasks that they couldn’t, such as finding English-speakers to help teach English or stealing away particularly talented singers. We haven’t discussed the symbolism in the novels we’ve read up to now for this challenge, but symbolism is such a big part of this novel, it deserves a special mention. For just one example, when Jun Do goes to Japan, he is given expensive new sneakers so he can blend in with the locals. Later, around the time when Americans board the fishing boat he’s on, his crew mates find brand new sneakers floating in the water from a container that has fallen off a ship. They collect the sneakers at first, but throw them overboard again once they return to North Korea. What do you think sneakers symbolize? The Orphan Master’s Son is by most accounts a difficult book to read, particularly in the beginning. There are, however, many things about it that make giving it a try worthwhile. It is particularly rewarding if you want to experience an imaginative and innovative way to handle a difficult and complex topic.